This is a reprint of a book originally published in 1905 by the Oliver Ditson Co. of Boston. 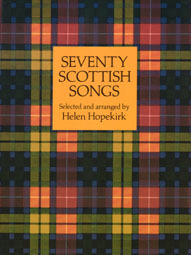 Helen Hopkirk was born in 1856 in Edinburgh, Scotland, and became a nationally known Scottish pianist. She eventually moved to Boston where she died in 1945. Few of these songs are well known in American. The publisher hopes "that this volume may rekindle interest in the neglected [Scottish] national repertory that it so abundantly represents".